Ethiopian members of parliament have elected Sahle-Work Zewde as the country's first female president. Ms Sahle-Work was a diplomat who has now become Africa's only female head of state. Prime Minister Abiy Ahmed appointed a cabinet with half the posts taken up by women. President Sahle-Work promised to work hard to make gender equality a reality in Ethiopia. In Ethiopia the Prime Minsiter Abiy Ahmed holds the political power. President Sahle-Work has served as an ambassador for Ethiopia in Senegal and Djibouti. She has also held a number of UN positions, including head of peace-building in the Central African Republic (CAR). Immediately before becoming president, Ms Sahle-Work was the UN representative at the African Union. According to Vatican News : The Ethiopian Catholic Church says it is pleased that women in Ethiopia are getting their rightful place in the development of the country. According to a statement from the Ethiopian Catholic Secretariat, it is a blessing to see that Ethiopians are recognising the invaluable talent women have to offer to the integral development of the nation. 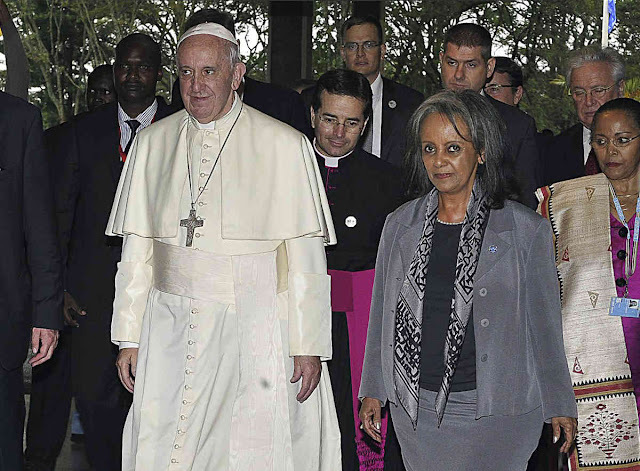 The Church’s affirmation came in a statement made available to Vatican Radio’s Africa Service, following the recent election of Sahle-Work Zewde as the first female President of the Democratic Republic of Ethiopia. Appointment normalises women as decision makers in public life Ethiopian Members of Parliament recently elected the veteran diplomat as its first-ever female head of state to succeed former president, Mulatu Tehsome, who recently resigned following a cabinet reshuffle. This makes Sahle-Work the only female head of state in Africa after Liberia’s Ellen Johnson Sirleaf completed her term of office this year.